Note: Product Composition ranges shown are typical for health, safety, and environmental use and not intended as specifications. a. Skin Contact: Those individually allergic to Chlorine should avoid direct contact as it may cause irritation with symptoms of redness, itching, and swelling. a. Inhalation: If dizziness occurs, immediately get into an open space – no other action is required. b. Ingestion: Drink large quantities of water and consult with a physician. ii. Respiratory and eye protection are required for fire fighting personnel. Full protective equipment (bunker gear) and self contained breathing apparatus (SCBA) should be used for all indoor fires and any significant outdoor fires. For small outdoor fires, which may be easily extinguished with a portable fire extinguisher, use of a SCBA may not be required. Do not allow chlorine gas to accumulate within a confined space. Insure proper ventilation to the outside. a. Small Spill: No special requirement. Wash to waste. b. Large Spill: No special requirement. Wash to waste. a. Precautions: No special handling required. b. Storage: If containers are used, insure containers are located in a well-ventilated area. c. Ventilation: Good room ventilation is normally adequate for a safe use of this product. a. Routes of Entry: Absorbed through skin. Eye contact. Inhalation. Ingestion. b. California Proposition 65 Warnings: This product does not contain any chemicals known to the state of California that cause cancer, birth defects, or any reproductive harm. c. Other Regulations: OSHA – Hazardous by definition of Hazard Communication Standard (29 CFR 1910.1200). To the best of our knowledge, this Safety Data Sheet conforms to the requirements of US OSHA 29 CFR 1910.1200.91/155/EEC and Canadian Hazardous Products Act. f. WHMIS (Canada): This product does not contain any known ingredient(s) on the “Ingredient Disclosure List”. Disclaimer: All chemicals may pose unknown hazards and should be used with caution. 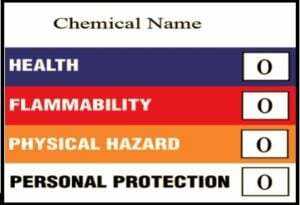 This Safety Data Sheet (SDS) applies only to the material as packaged. If this product is combined with other materials, deteriorates, or becomes contaminated, it may pose hazards not mentioned in this SDS. It shall be the user’s responsibility to develop proper methods of handling and personal protection based on the actual conditions of use. While this SDS is based on technical data judged to reliable, HCI, LLC assumes no responsibility for the completeness or accuracy of the information contained herein. Enjoy this post? Share with a friend! Our Mission is to help parents create healthier homes by taking the worry & toxins out of cleaning.